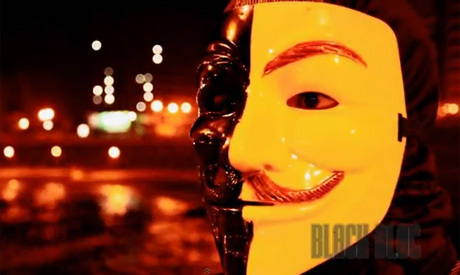 A screen shot from the Black Bloc's video statement showing a protester wearing "Vendetta's" mask. A group of young protesters, who identified themselves as the "Black Bloc", have marked the second anniversary of the Egyptian revolution by blocking the tramway tracks in Alexandria on Friday. About ten people wearing black masks stopped the tramway track using traffic barriers, and have also blocked the road at Al-Qaed Ibrahim Square where protests are expected to take place. This is not the first appearance of the group as they also protested in Cairo on Thursday. They marched from Talaat Harb Square to Tahrir in central Cairo, banging drums and saying that they will "continue the revolution" and will “defend protesters in Tahrir”. "We had to appear officially to fight against the regime of the fascist tyrants, the Muslim Brotherhood and its military wing," they said in a video posted on YouTube on Wednesday. The short video, filmed at night in Alexandria, shows men wearing black clothes and covering their faces with black masks. Some were holding the Egyptian flag while others carried black flags with an "A" sign. "We strongly warn the [ministry of interior] of intervening in this matter, and if it confronts us, we will not relent. Glory to the martyrs, victory to the revolution," they added. The group insisted it does not have any pages on social network websites but several pages bearing names like “Black Block Egypt” and “Revolution Black Bloc” were created on Facebook on Twitter. They attracted thousands of subscribers. Internationally, the tactic of the "Black Bloc" was used by many protesters in Europe, particularly in Germany in the 1970s and in anti-globalisation protests in the late 1990s and early 2000s. Black Bloc groups usually wear face-concealing items during their protests. They traditionally resort to violence to achieve their goals. The real people behind the Egyptian revolution are no longer there; those were the real civilized Egyptian; absolute politeness and very peaceful. The people you see in the streets these days, either with or against Morsi, are not considered by all means civilized people. Look and listen to their slogans and acts, look at the destruction they are causing to private and public properties. It's really disgusting to see these people. Instead of doing all this, work with the oppositions and push them to get united and win the majority of the parliament seats and get control. Black Bloc and Ultras, pls stop blindly imitating the west and be aware and vigilant to the good of Egypt. Pls use your brain and do not be part of Egypt's destruction. I'm down with that...how can I join Black Bloc!? I'm gonna cut the political mumbo jumbo. It's beyond time people power translated into some on the ground reality. I will find and join you. You've got style in bringing down tyrants, much respect!